Facilities Management (FM) broadens the approach to mitigating consumption during peak energy demand days throughout the summer by looking at the bigger picture. For those keeping track, Western is entering the seventh summer of dialing back the air when the provincial drain on energy reaches its peak. Previously referred to as Global Adjustment, our efforts have led to electricity savings of roughly $2 million for each the last few years. Taking a step back to widen the scope, members of the Facilities Management Division are taking a more comprehensive approach to this year’s activities. FM has begun to review current infrastructure with the goal of right-sizing the services and demand on the electrical grid into the future. 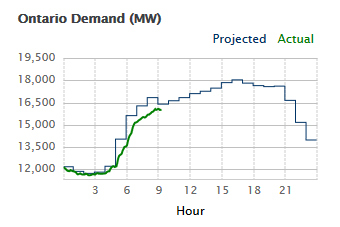 Demand Management is a pre-emptive strategy designed to take more control over Western’s energy demand as a whole. That return would save the University financially, but -more importantly- would better meet customer needs. For example, Facilities Management is investing in a more robust chilled water and air handling control. As a result, FM can cycle through chillers and air handling sequences that can vastly improve the efficiency and the overall life of the units, leading to fewer interruptions of service. In addition, FM has started recommissioning buildings, such as, Western Student Services Building, which results in improved occupant comfort and electrical demand reductions. Facilities Management continues to offer demand management related information online (www.uwo.ca/initiatives/demand_management) as well as advanced forecasting of peak day activities. In previous years, Facilities Management was required to initiate mitigation sequences well ahead of the curve to ensure the peak was met. With new technology, FM can turn down/off unoccupied buildings, while maintaining comfortable conditions to occupied spaces. Also, with most organizations reducing energy along with Western, the peaks are now later, more likely between 4pm and 8pm. The IESO Global Adjustment fee is only subject to the five highest energy demand days of the year. In some years, such as 2013, these peaks occur in a single week.This is great for 'getting it over with' but was a challenge keeping building occupants comfortable for five straight mitigation events. It is estimated, and true last year, that for each megawatt that is shed during peak days Western defers upwards of $125,000 in energy fees. Facilities Management aims to reduce electrical demand by about four mega watts during peak days, equating to nearly $500,000 per peak day. 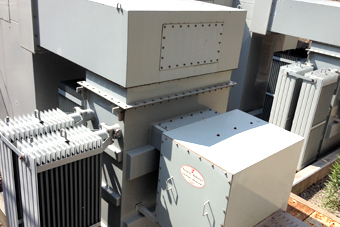 There are four chillers in the main Power Plant located in the South end of campus and four in the North Plant. Along with several satellite units, chillers and air conditioners make up the vast majority of our energy consumptions during the summer months.